THERE may not be real pots of gold but Japanese food lovers may find something to appease their palates at Kin No Uma’s Pot Of Gold promotion. From now till March 31, the Japanese restaurant at Palace of the Golden Horses will feature seven “nabemono” (steamboat) dishes during the promotion period. Nabe means cooking pot while Mono means things in Japanese. 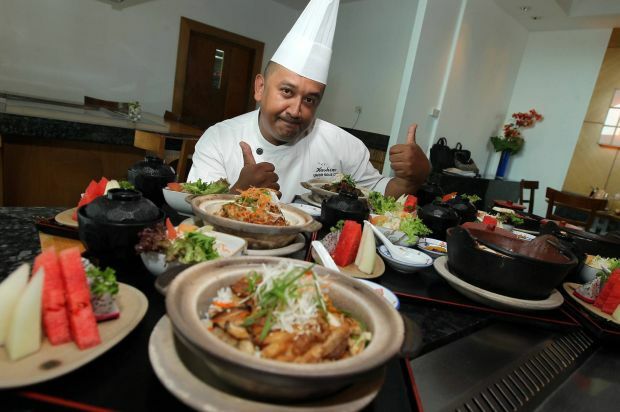 Sous chef Mohd Khair Hashim began his culinary career 24 years ago in Japan, at one of the sushi restaurants in Kyoto. The affable chef recommended the Saba Miso Yaki Nabe as it was a healthy dish. 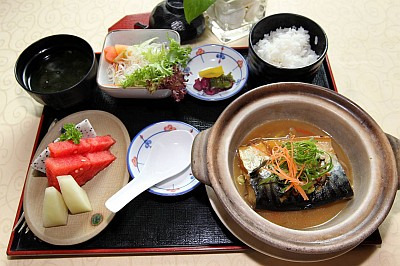 “The blue mackerel fish is rich in Omega 3 and the fish and vegetables are cooked in a claypot with shiro-miso paste. The soybean paste is a healthy choice and a favourite among Japanese customers. “Vegetables such as spinach, cucumber, cabbage and tomato are grown in our own organic garden,” he said. Healthy choice: The chef recommends the Saba Miso-Yaki Nabe. The chicken options are Tori Teri Nabe (claypot rice with chicken Teriyaki) and Tori Katsu Nabe, both RM26. I enjoyed the appetising Japanese plum sauce in the Tori Katsu Nabe. The Yakiniku Gohan Nabe (RM28) features pan-fried beef and vegetables with yakiniku sauce while the Yagi Sukiyaki Nabe (RM30) has sliced lamb, vegetables and beancurd cooked in an iron pan with sukiyaki sauce. Seafood lovers could opt for the Kaisen (seafood), Kimchi Nabe (RM36), a potful of seafood and veggies cooked in Kimchi Paste or Udon Suki (RM40), which has assorted seafood, and grilled beancurd. All sets come with miso soup, pickles, fruits and rice, except for the Udon Suki where Udon noodles are served. We ended the meal with Matcha ice-cream, topped with red bean ice-cream, it was oishii (delicious in Japanese)!